He's looking to get patents etc, so it would be unwise of him to say anything at this stage ( especially as I am a notorious conman when it comes to officially patenting other people's ideas.) as it's all too easy for info to get out to the wrong people. I'm fascinated to know what it is, I have to say... all he'd tell me is it was a new process. I picked up my dragon this morning from the sorting office (missed the delivery on Saturday). I've had a quick look over it before work and I have to say, it looks amazing. I can't wait to get home and have a proper look. At the risk of sounding like a gushy fanboy I've got to say the quality is nothing short of astounding. The level of detail that has gone into this model is ridiculous, little things like how the skin/scales have bunched up on the neck where the dragon has turned it's head. The feeling of natural motion that the whole thing gives off, there's nowhere that I can see where Andy has skimped where the sculpting is concerned. I'm no noob either I've been collecting miniatures for nearly twenty years and, this is in fact my 3rd big dragon. 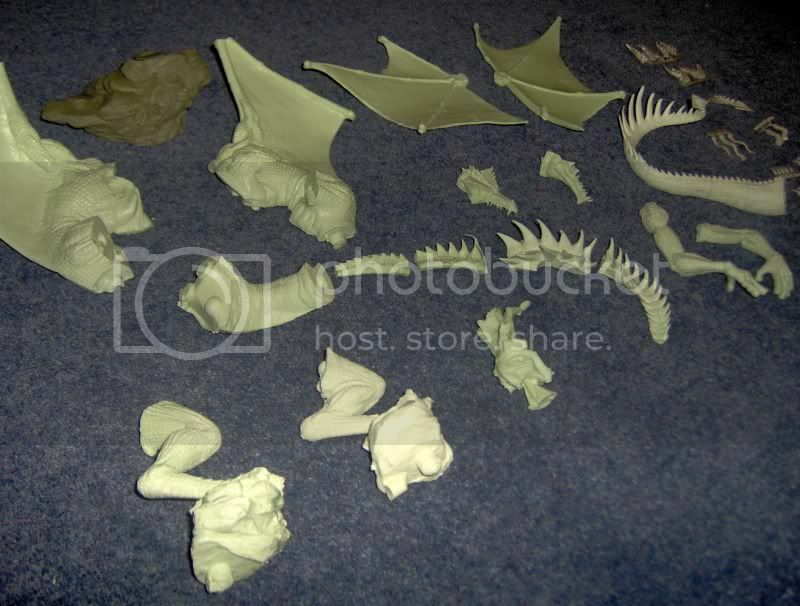 I've also got a Forgeworld Fire Dragon and the Colossal Red Dragon from D&D, and neither come close to this level of detail, quality or scope. As I'm sure others with tell you who have seen one of these in the flesh, pictures don't come close to doing this model justice. And as requested here's some pics of the pieces. Thanks a lot! I thought it was made of hundreds of shiny little pieces... Here I see a Solid Ball of Rock. stop showing me pictures ! Old mould was still hanging in there, and it's quicker to cast single-piece tails than three separate ones...but it's gone to the great mould house in the sky now, so kits from now on will be 3-parters. could you tell me what number I have in the queue? But no hurries on my account, I would rather have a good cast than a rushed cast. You both get points. 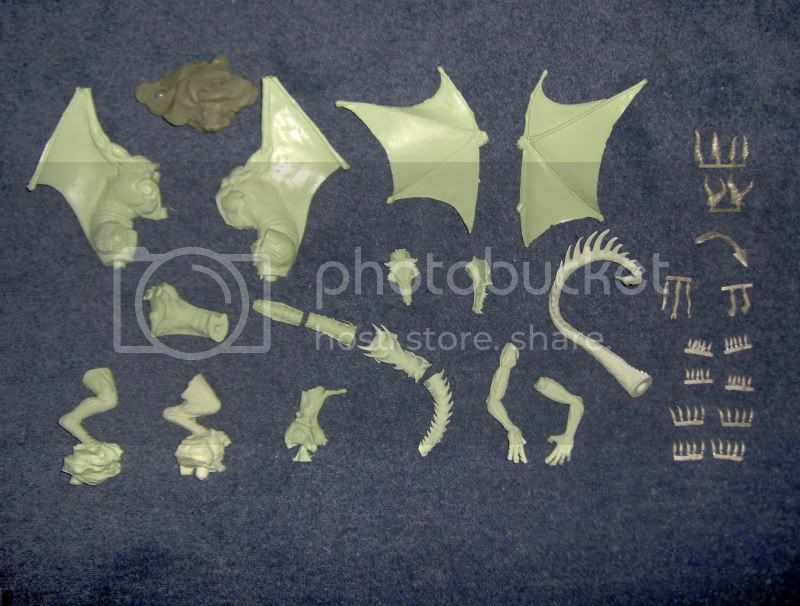 Ed at Trollforged is too busy to do the dragon (I will persist in begging him) and there are rumours of a new spincastable resin being worked on by certain resin suppliers. No idea what Adam's new process is over at Black Scorpion, he won't drop any hints! Brilliant photos ned - thanks for sharing! 'Fragile' doesn't mean 'cushion' or 'pillow' or 'stepladder' in German, does it? Fragile is "fragil" in german, too. But the package looks now like a pillow. But now is unboxing time. Edit: All dragon parts without damage! The casting quality is almost perfect. And the dragon itself, only WOW. I still think "Small Packet" is rather misleading in this case.